Why spend your winter days shivering at home when you could be soaking up the warm Savannah sun? At Presidents’ Quarters Inn, we’re lucky enough to enjoy pleasant weather all year long. Even after the holidays are over, there are plenty of fabulous things to do in Savannah in January. From historic sites to festivals to restaurants, our charming city has it all! Want to make the most of your trip to Savannah? Be sure to download our free Vacation Guide today! One of the best things about visiting the city in the off-season is that long lines at Savannah’s finest restaurants are rare. You can easily indulge in Southern comfort food, French bistro fare, or contemporary cooking in downtown Savannah. If you’re looking to try some of the city’s higher-end cuisine for a great price, Savannah Restaurant Week is in full swing every January. If you happen to be in the city on a chillier day, escape the cold with a tour of one of the city’s many historic sites. Our favorite is the Andrew Low House, former home to the founder of the Girl Scouts, Juliette Low. This beautiful manor features the original cast-iron railings, woodwork, and gardens from its construction in the 19th century. The Savannah Hockey Classic has been a great draw for sports enthusiasts since its beginning in 1999. This annual hockey tournament features four of the South’s top college hockey teams: University of Georgia, University of Florida, Georgia Tech, and Florida State. Get your foam fingers and be ready to cheer, because tickets start at $12 for a full day of games! Voted the Number One Art Event in the city,, Savannah’s monthly Art Walk is a completely free exploration of the city. Dozens of Savannah’s best galleries are open to the public. The event starts with complimentary cocktails at the Hyatt Hotel, and it concludes with more free beverages and an art raffle at the DeSoto Hotel. Guests have the opportunity to meet the artists and see beautiful art, all while experiencing the town’s breathtaking architecture! Every year, locals and tourists line the streets downtown in honor of Martin Luther King Jr. The MLK Day Parade is a showcase of hundreds of participants who show off their decorated floats for this special day. If you’re looking for other ways to celebrate the holiday, there are plenty of other black heritage sites to visit in the city. For instance, the Ralph Mark Gilbert Civil Rights Museum presents exhibits on the NAACP and Savannah’s modern-day Civil Rights Movement. Looking for a casual way to spend your Saturday morning? Come and visit the Forsyth Farmers Market! Enjoy craft bread and freshly-baked pastries as you stroll under the park’s beautiful oak trees. Be sure to warm up with a cup of coffee beforehand, because this market’s 30 vendors only serve and sell food. All of the tasty treats at the market comes from within a 200-mile radius, so it’s guaranteed fresh! 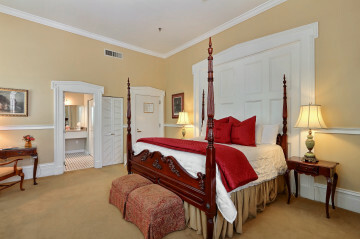 Avoid the post-holiday blues by booking your stay at Presidents’ Quarters Inn today! Unwind after a day of exploring the city with an evening cordial in our parlor and a homemade sweet on your pillow. In our beautifully-renovated Abraham Lincoln Room, you’ll find a grand four-poster bed, parlor doors, and a view of Oglethorpe Square. From the moment you arrive at our historic inn, you’ll be treated with genuine Southern hospitality. Don’t wait; reserve your room today!